As a final post about my Halloween party from last week, I wanted to give you a few tidbits on hosting your own "Hallowine" party. After all, the entire point of the event was to taste a few spooky bottles of wine! I took it upon myself to find some of the creepiest labels that my local wine merchants (aka. Target & Publix) had to offer, and I was more than pleased with the results. I decided on a flight of four reds for my guests for a few reasons. First, we all love red wine. Second, red is way creepier than white (it's HalloWINE, people!). Third, red pairs just fantastically with chocolate, and there just happens to be an abundance of that this time of year. 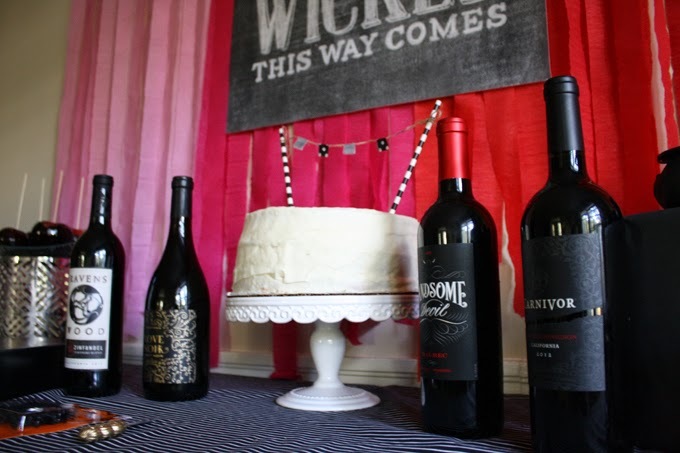 To host a Hallowine Tasting, start with the wine of course! You can choose any variety of wine you like - a sparkling flight, a white flight, flight by type, or flight by year. It is totally up to you which is part of the fun. My requirement? 4 different reds with 4 creepy labels/names. Clearly I was in it for the theme, not so much the wine, but it worked for this particular event! Next, decide on the food that you'll pair with your wine. My tasting paired wine with 4 different kinds of chocolate. 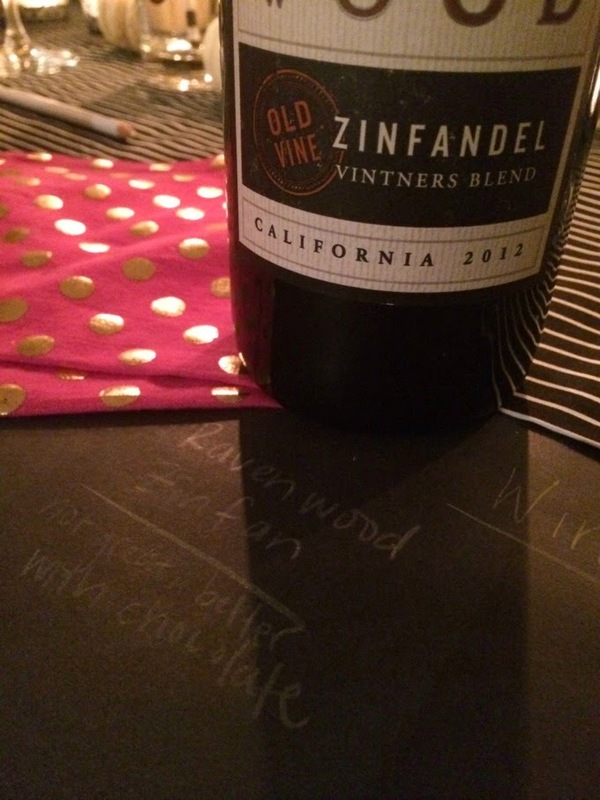 The zinfandel paired with Krackel, the pinot noir with dark chocolate, the malbec with Mr. Goodbar, and the cabernet with Twix. Finally, create a way for guests to remember what they tasted and which wine they preferred. I covered my dining table in black paper and passed out white colored pencils. Guests wrote their "tasting notes" directly on the table which was easy for me and easy for them. Done and done. Be sure to organize your tasting so that you start with the lightest wine and finish with the heaviest. In my case, that meant starting with the zinfandel and finishing with the cab. Need to know exactly which wine I used? Happy to oblige! Ravens Wood zinfandel, Love Noir pinot noir, Handsome Devil malbec, Carnivore cabernet. See the other posts in this series here, here, and here. P.S. I am just thrilled that this post was written exactly ONE WEEK before we leave for Napa! YAY! How have I never heard of a "Hallowine" party before?! I LOVE THIS! Thanks, Ashley! It was SO it fun to go shopping for those spooky wine labels, and honestly it really helped to narrow the selection.